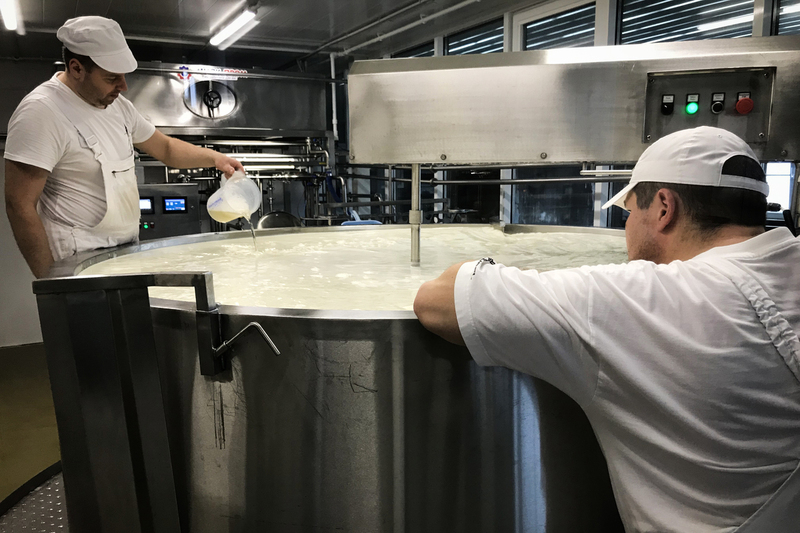 In Russia, A Dairy Owner Dreams Of Delivering Cheese To Vladimir Putin "Normal people collect stamps and I try to give my cheese to Putin," says cheesemaker David Sirota. "I know 100 ways to get into an event with Putin but every time, his security takes away my cheese." Oleg Sirota, owner of a cheese factory outside Moscow, buffs the surface of his cheeses with salt brine. The name "Putin" appears on a wheel of cheese (left). Russian President Vladimir Putin was fielding questions from a hall of sedate academics last month when suddenly, Oleg Sirota's riotous head of curly brown hair popped out of the crowd of dark suits. "I'm a farmer and cheesemaker from the Moscow region," Sirota declared on national TV. "I wanted to thank you for the sanctions." Putin tried to correct Sirota, saying it was the Americans he should be thanking, but in his exuberance, the bearded cheesemaker barely took note. Instead, he invited Putin to come visit his dairy and pick up a wheel of Swiss-style mountain cheese that has been ripening especially for him over the past four years. The sanctions Sirota was hailing are part of the Russian embargo against European and U.S. food imports. Putin's government introduced the ban in 2014 in retaliation for Western sanctions meant to punish Russia for its annexation of Crimea and support for an armed insurrection in eastern Ukraine. Back then, Russia was dependent on foreign food imports, especially from the European Union. Moscow supermarket shelves groaned under Italian salamis, Dutch tomatoes, Irish butter and French potatoes. Russian farmers, already struggling with the transition from communism to capitalism, could hardly compete with the EU's highly subsidized agricultural juggernaut. In 2014, though, "Putin managed to completely change our country's course of development," Sirota, 30, tells NPR at his dairy outside Moscow, less than 50 miles from the Kremlin. "The old way of doing things was broken, and the government realized we need to make everything ourselves: tractors, combines, cars, cheese, bread — everything." Sirota says he was interested in farming as a boy and enrolled in an agricultural college. But he dropped out and went into information technology because he didn't see a future for farming in Russia. Then came Putin's military intervention in Ukraine, followed by Russia's international isolation. Sirota spotted a business opportunity. 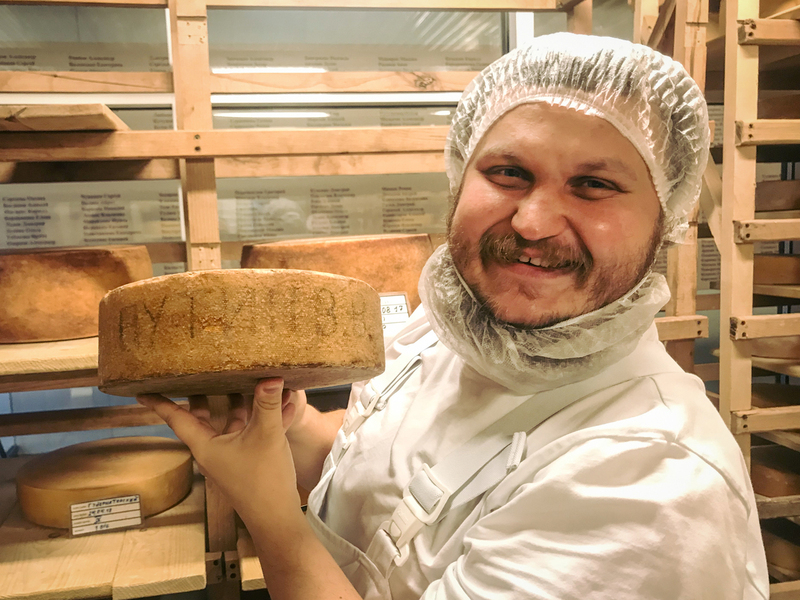 In 2015, he started Russky Parmezan (Russian Parmesan) in the village of Dubrovskoye. "I dropped everything," he says. "I sold my apartment, my car, my business — and moved into a trailer on a field to start my dairy and live the Russian dream." Sirota shows off a wheel of cheese with Vladimir Putin's name. He's been saving it especially for the Russian president, but so far has had no luck delivering it. He started out with just one partner, Sergei Nedorezov, a Russian who had learned to make cheese in Germany. Like most start-ups, the dairy began on shaky financial footing, but Sirota says he tapped into a groundswell of support for locally produced food. By chance, he found a Swiss dairy farmer living in a neighboring region who could provide him with high-quality milk. And then, the Russian Agriculture Ministry started offering subsidies to farmers like him. Sirota says the government gave him about $350,000 to build a new cowshed. "The government bought every second cow for me," says Sirota, as he shows off the new cowshed. He now owns 40 cows and plans to buy 60 more next year. Sirota says he can't produce all the milk he needs but at least wants enough of his own to make Parmesan, which takes one-and-a-half years to mature. A wheel of the hard cheese weighs 65 pounds and sells for 40,000 rubles, about $600. The dairy industry is booming. 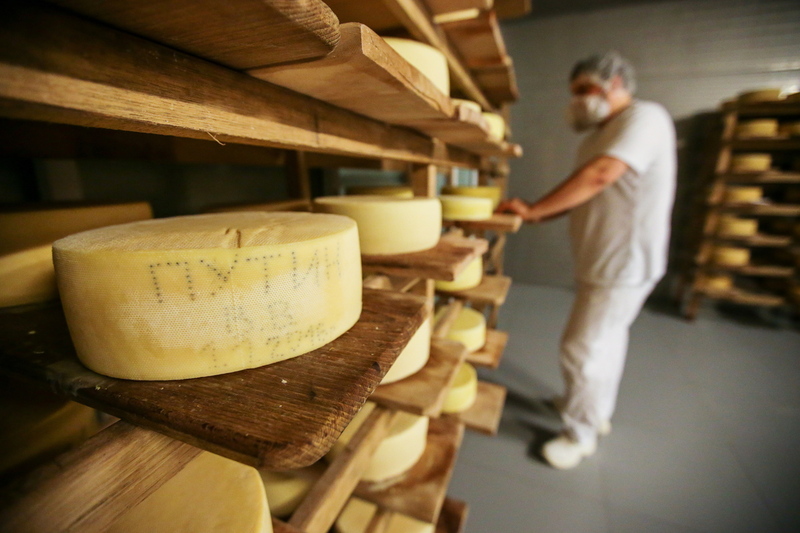 Before the sanctions, there were just six cheesemakers in Russia, Sirota says. Today, there are 400. Russky Parmezan employs 50 people, most of them in sales. Russian agriculture as a whole has seen an upswing since the counter-sanctions were imposed. Wheat exports have reached record-high levels, giving American farmers a run for their money. Meat production increased by 14 percent during the first three years of the embargo, and domestic dairy products now cover 82 percent of Russia's domestic needs. Part of Sirota's brand is politics, which he says is inseparable from farming. A plaque at the entrance to his creamery says it was opened "on the first anniversary of Russia's introduction of countermeasures to Western sanctions." A flag used by Kremlin-backed fighters in eastern Ukraine flutters over the dairy. He even has a goat named after German Chancellor Angela Merkel, one of the main backers of sanctions against Russia. Sirota, gregarious and self-deprecating, is unapologetic. "Russians are like a spring. The more you push them down, the stronger they bounce back up," he says. "We've developed the most when we understood that we were surrounded by enemies and could only rely on ourselves." Workers in the Russky Parmezan (Russian Parmesan) dairy prepare cheese. Sirota says almost all equipment in the factory is Russian-made. Sirota boasts that practically all the equipment in his immaculate facility is Russian-made, except for some pumps, milk hoses and mops. Through large windows, customers at the dairy's sales counter can watch workers making cheese in giant stainless steel vats. "Of course French cheese is tasty," says one shopper, Vladislav Kudinov, a Moscow businessman who owns a house nearby. "But the cheese made here is also good. Cheese is like people: we're all basically alike, but still have different faces and personalities." Besides Parmesan, Sirota makes cheese with names such as Tirolsky (Tyrolean) or Gubernatorsky (Governor's) that have the same texture as hard Swiss cheeses, with a mild, nutty flavor. Sirota wants to return to the traditions before the Bolshevik Revolution, when the Russian Empire sold cheese and butter to Western Europe. He's trying to get ahead of the competition and start exporting to Austria, Germany and France. Yet there's a domestic customer he's still pursuing without any apparent success. "I have this hobby. Normal people collect stamps, and I try to give my cheese to Putin," Sirota says. "I know about a hundred ways how to get into an event with Putin, but every time, his security takes away my cheese." After his on-camera offering to the Russian president last month, Sirota says he received a visitor claiming to represent "you know who." Sirota eagerly loaded up the mysterious guest's car with 100 pounds of his best cheese and saw him off. "Now I'm sitting here wondering if he really came from Vladimir Putin or was some kind of con artist," Sirota says. "My wife says I'm an idiot." Sirota laughs out loud. He doesn't seem bothered in the least.